Fluffy and Antigoni Tsagkaropoulou invited Fenia Kotsopoulou and Daz Disley to keep each other company inside Fluffy Library for 7 days and to discover various secret aspects of Fluffy itself. 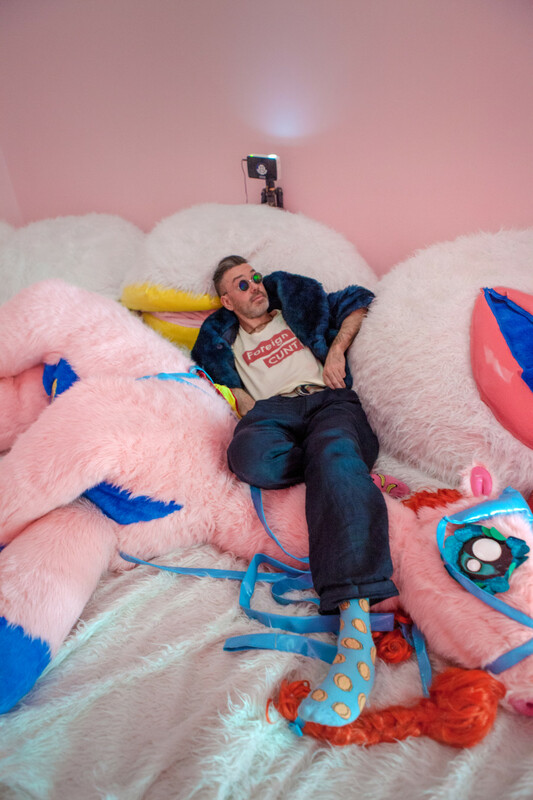 What could you find out if you sleep in Fluffy and cuddle with the pink little horse for 7 days? What secrets will Fluffy share with you and what kind of stories pop-up from the library and become reality during the night? And when you ask for bedtime stories, will you hear the voice of Fluffy itself·before you fall asleep? Every day they discover more and more : during the nights, hairy deviances dance and masculine fairies whisper fairytales. On Friday 25 January from 8:00 p.m. we invite you into a performative audiovisual get-together, with video by CUNTCINEMA and new fuzzy friends of Fluffy. CUNTCINEMA is the continuation of VULVOgraphy, the creation of a portable tiny cinema, which aims to display movies about identity, gender, body, shame and crisis. Until then you’re welcome to come and visit them and to play all together, when Fluffy Library is open. Thursday & Friday 2:00 p.m. – 8:00 p.m.
#TextMe_FluffyLibrary is an unusual library- is an unusual library-participatory installation by the artist Antigoni Tsagkaropoulou, curated by Vassilis Zidianakis. All the events, that are happening inside Fluffy are co-curated and organized by Antigoni Tsagkaropoulou in collaboration with other individuals, artists, educators, friends etc. 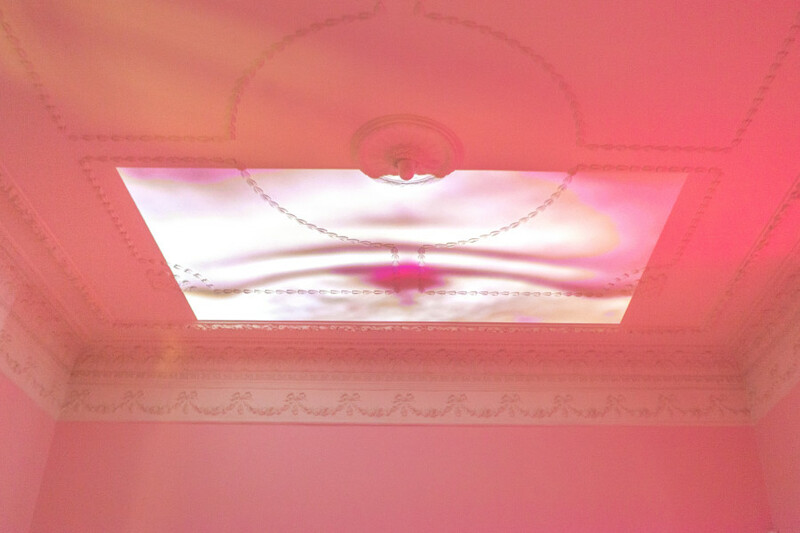 Fenia Kotsopoulou is a cross-disciplinary artist and associate-lecturer for the University of Lincoln, UK. She holds an MFA in Choreographing Live Art (University of Lincoln), a BA in Dance (National Dance Academy of Rome) and Italian Language and Literature (Aristotle University of Thessaloniki). Working in the fields of dance, performance, video, photography and alternative image-making, Fenia’s work interrogates memory, time, (de)construction of identity, and body-centred shame. Daz Disley is a video & sound artist and technical facilitator. His work has been seen at festivals all over the world, and he’s a keen experimenter in both digital and analog domains, exploring a variety of alternative image-making processes and hardware systems design. As a board-member and resident-artist with the organisation ‘SlumGothic’ working with disadvantaged communities in Gainsborough, Lincolnshire to leverage arts and art-practice as social-glue, he regularly gets involved in delivering events and festivals at ‘x-church’. 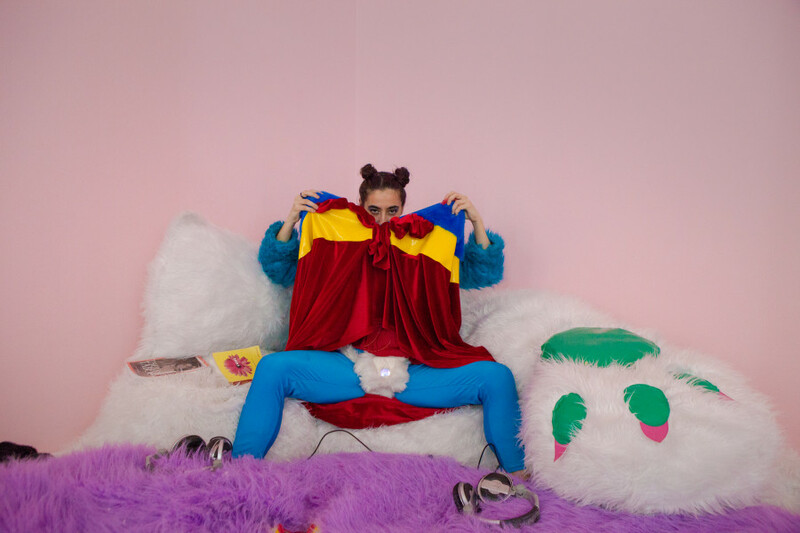 Antigoni Tsagkaropoulou is the artist and creator of Fluffy Library. 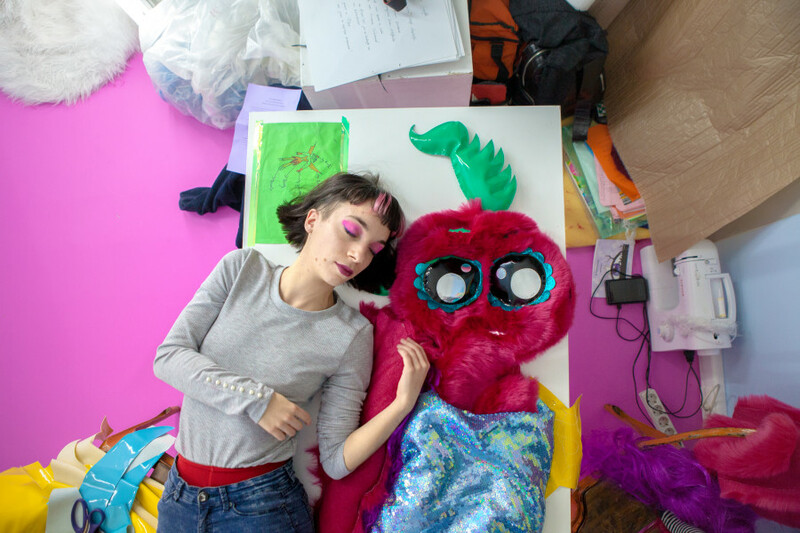 Her work combines large-scale participatory installations with interactive and impromptu performances, plush sculptures and furry costumes. Deeply influenced by queer and feminist dialogues, her sources of inspiration also include lgbtqi+ fairy tales, feminist sci-fi literature, children’s stories, the furries’ subcultures and the natural world.